Uwe Meffert's pages. He produces and sells many puzzles, including this one. 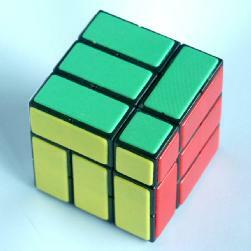 The Bandaged Cube puzzle can be made from a standard Rubik's Cube by gluing pieces together. Seven of the corner pieces are glued to edges to make seven 2x1x1 movable pieces. The five remaining edges are glued to the face centres; one glued to two adjacent centres, and the others are glued one on each face. The glued pieces make this puzzle very difficult because moves are very often blocked. It is a little like the Square One puzzle, in that the possible positions do not mathematically form a group. Nearly all other moving piece puzzles do form groups because they are in effect (isomorphic to subgroups of) permutation groups, usually generated by the simplest possible moves. On this puzzle not every move is possible at every moment so the face turns cannot be considered generators of a group. There are 440 configurations, i.e. there are 440 positions if the colours of the pieces are ignored, and it takes at most 12 moves (or 15 if half turns are counted as two moves) to get to the same configuration as the solved position (free corner at UFR, face centre edges at UL, RB, FD, LD). Once in this configuration only the seven glued corner/edge pieces need to be swapped about in order to solve it. Click to view full table. Click to view summary table. This shows that the puzzle can always be solved in at most 28 moves (18.801 on average) or 35 if half turns count as two moves (21.938 on average). In Sloane's On-Line Encyclopedia of Integer Sequences these are included as sequences A079770 and A079771. Once in a given configuration, the positions in such a configuration do form a (permutation) group. It is generated by the application of move sequences that return the puzzle to the same configuration. It turns out that only even permutations of the glued corner/edge pieces can occur. The reason is quite subtle: Note that for a face to move, it must contain the unglued corner piece. Any sequence of moves that permutes the pieces, bringing them back to the same configuration must have an even number of quarter face turns to bring the free corner back to its original position, and therefore must be an even permutation on the seven glued corner pieces. There are 440 configurations, and in each of these the 7 glued pieces can have any even permutation. Therefore there are 440·7!/2 = 1,108,800 positions. The same notation is used as for the Rubik's cube. The letters U, D, L, R, F, B are used to denote the faces of the cube. The letters also denote a clockwise quarter turn of that face. A letter followed by a 2 or an apostrophe denotes a half turn and an anti-clockwise quarter turn respectively. A combination of letters can be used to denote a particular piece position on the cube, e.g. URF means the corner contained in the three adjacent faces U, R, and F.
Unlike the Rubik's Cube, this puzzle has a fixed orientation, i.e. it matters which way up you hold it. First find the edge piece that is glued to two face centres, and hold the puzzle so it is in the DB position. Now find out the colours of the unglued corner, wherever it is on the puzzle. If the colours match those of the F, U and R face centres then you are holding the puzzle correctly for the solutions below to work. If they match the F, U and L face centres then turn the puzzle over so that the F and U faces swap places. If neither of the two cases above holds, then you have a puzzle that is glued differently, and the solutions below will not help you much. In the solved position the U face edge is at UL, the R face edge is at RB, the F face edge is at FD, and the L face edge is at LD. This solution is mostly just a list of move sequences, one sequence for each possible way each piece needs to move. It is therefore not really suitable for memorisation, but it is relatively fast. Before starting this solution you must understand the notation and make sure you are holding the puzzle as outlined there. This is quite a complicated process, but the following steps will do this in a fairly direct manner. Use any moves to bring the free corner to the UFR position, though its orientation need not be correct. If the L edge is at LF then try doing U2 L U'. There are two cases where this does not work, and those can be brought to the initial configuration by doing either U'R' or R U followed by ULFU'F'U'. If the L edge is at LU then try doing F2 L' F. There are two cases where this does not work, and those can be brought to the initial configuration by doing either R F' or F R followed by F2 L'FUFU L'UR'. 1. If the R edge is at RU then do either R U or F R.
2. If the R edge is at RF then do either U'R' or R'F'. 3. If the U edge is at UF then do U F.
4. The L edge can now be usually be corrected by either UL'U2 or F2L'F. There is only case in which neither work, and that can be brought to the initial configuration by doing R'F'UF'L'U'. Now the U, R, and F edges can be put at UL, RB, FD by using the sequences U'R', R'F', F'U' and their inverses R U, F R and U F. This is quite easy since each sequence turns two adjacent faces in the same direction. First move any edges that are adjacent to the free corner, and then at most one of the sequences is needed to put them in position. There is one case (U and F edges at UR, FR) which can only be solved by using the left face, by the sequence UL'U'LFU2R'. Find the piece belonging at the LBD position. Find the piece belonging at the RDB position. Find the piece belonging at the LFD position. Find the piece belonging at the RFD position. If the piece lies at RUB position, then do either one of the two sequences in the next phase to move the top layer pieces around. Find the piece belonging at the UBL position. This solution is more suitable for memorisation. It only uses a few move sequences, but it takes much longer than the first method. Before starting this solution you must understand the notation for the previous solution and make sure you are holding the puzzle as outlined there. In this solution, we will use some new notation. Let C be a clockwise rotation of the whole puzzle about the URF corner. In other words the U face moves to R, the R face moves to F and the F face moves to U. Similarly, let A be an anti-clockwise rotation about URF. Note that this solution will also use turns of the D face, and this involves the movement of two layers rather than just one. Phase 2: Place the LBD piece correctly. Find the piece belonging at the LBD position. If it is already correct then go straight to the next phase. If it lies at FRD then do C ( F R U F R' F2 U' ) A.
Repeat the sequence F R U F R' F2 U' until it lies at UBL. Do the sequence R D R' ( F R U F R' F2 U' ) R D' R'. Phase 3: Place the FRD piece correctly. Find the piece belonging at the FRD position. If it is already correct then go straight to the next phase. Repeat the sequence F R U F R' F2 U' until it lies at FDL. Do the sequence A (F R U F R' F2 U' ) C.
Phase 4: Place the BRD piece correctly. Find the piece belonging at the BRD position. If it is already correct then go straight to the next phase. Repeat the sequence F R U F R' F2 U' until it is correctly at BRD. Find the piece belonging at the FLD position. If it is already correct then go to step d.
If the piece belonging at FLD is not at UBL, then repeat the sequence R U R' F2 L F L' U' F until it is. C (F R U F R' F2 U' ) C (U F2 R F' U' R' F' ) A (F R U F R' F2 U' ) A. Note that the middle part is the inverse of the usual sequence. Perform the sequence R U R' F2 L F L' U' F once or twice until the remaining three pieces are correct. When I devised solution 2 I hoped that from phase 3 onwards the puzzle could be solved by only using turns of the F, R and U faces. This turns out not to be the case. After phase 2 there are 6!/2=360 possible positions left, but F, R and U turns generate only 60 of them. There is a very neat proof of this. I'll just give the bare outline here. First consider the main sequence used in the solution. This can be performed in 3 orientations (that is what A and C are for) and also in reverse. This gives 6 basic move sequences. Any move sequence of the F/R/U faces can be built by combining these 6 basic ones. This is the trickiest but least interesting part of the proof so I'll skip it. These basic move sequences perform 5-cycles on the pieces of the puzzle, so it remains to be seen what positions are attainable by combining these 5-cycles. An easy way to show that these give no more than 60 positions is by looking at an icosahedron. Each pair of opposite corners of the icosahedron can be identified with a piece so that the 5-cycles correspond to rotations of the icosahedron. The icosahedron has only 60 different orientations so there can be no more than 60 positions generated by the 5-cycles.